Took 3 guys and 2 girls to finish this. Had the experience to behold on a big serving of fries and surrender to it before it was finished. My Geek Wars team, "YKhurat", won a Super Large Fries (SLF) at Red Patatas Fritas. prize coupon from Geek Wars. When our order came, our jaws dropped when we saw it was a 1kilo serving of fries flavored barbeque, sour cream and cheese. It was more that enough to serve 4 persons that composed of two girls and two guys. We had to call a fifth person (one more guy) to help us finish it. We called a sixth person, but he didn't see a fry left when he arrived an hour after. It was good, especially when it was still warm. So enjoy it right after it was served to your table. 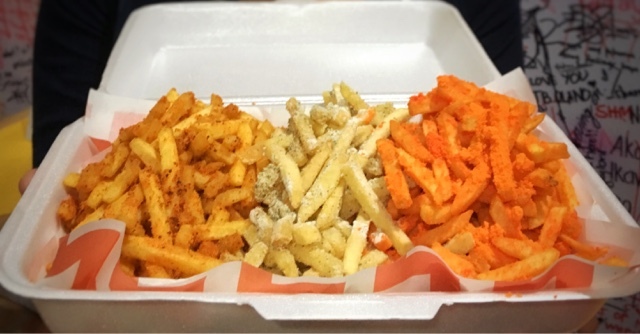 Red Patatas Fritas is located in Hayes - Pabayo Streets, Cagayan de Oro, Philippines. They are open during 11:00am-7:00pm, except Sundays.